This week’s recipe was a civilized pause to the World Cup madness which has been going on around me for a little more than a month now. As an american living in Germany working for a Dutch company and with lots of colleagues from other corners of the globe, soccer (or, football, as everyone else around me calls it) has pretty much been the only topic of conversation. It really is one of those, if you can’t beat em join em, type of situations. Which means that I found myself sitting in bars, well past my bedtime, both Tuesday night for the historic Germany-Brazil game and then again Wednesday night to support my Dutch boss during the Netherlands-Argentina game. This Sunday it will be Germany vs. Argentina in the final game. And after that, I’m looking forward to catching up on my sleep! 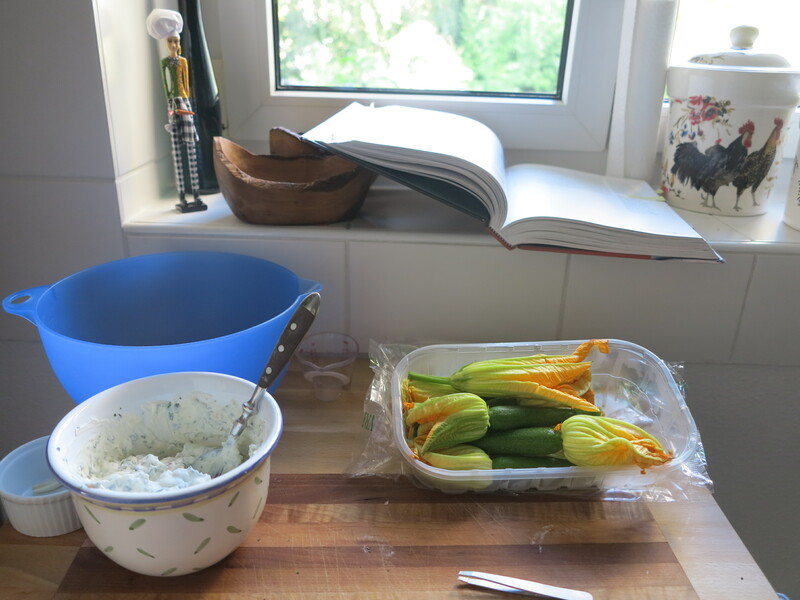 But back to this week’s French Fridays with Dorie recipe, Ricotta-Filled Zucchini Blossoms. I can’t tell you how excited I was to be making this recipe. 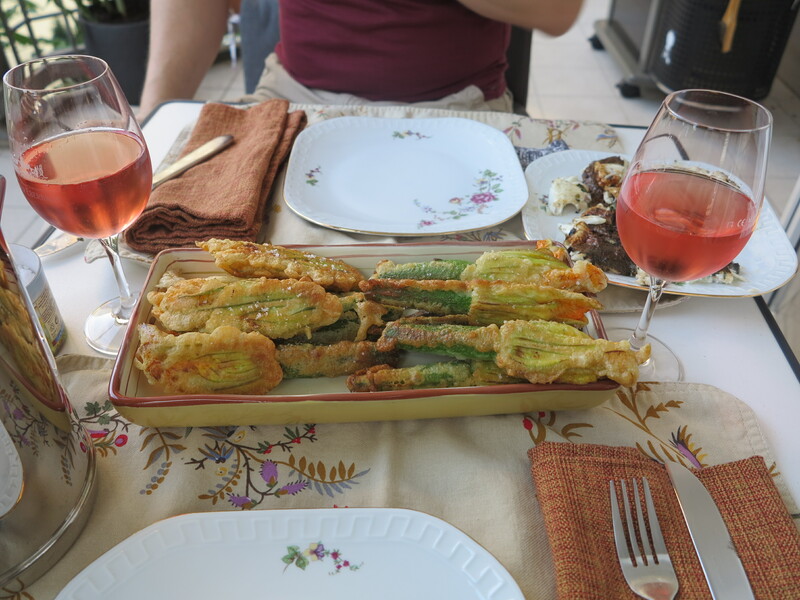 The idea of cooking with zucchini blossoms was new and intimidating and I envisioned myself crying in the kitchen over torn up flowers. As it turns out, the blossoms were easier to work with than I had feared. Fiddly for sure and it does take a little time to get everything together, but as Dorie promised, the batter covers up all manner of sins and I was really pleased with how well they turned out in the end. 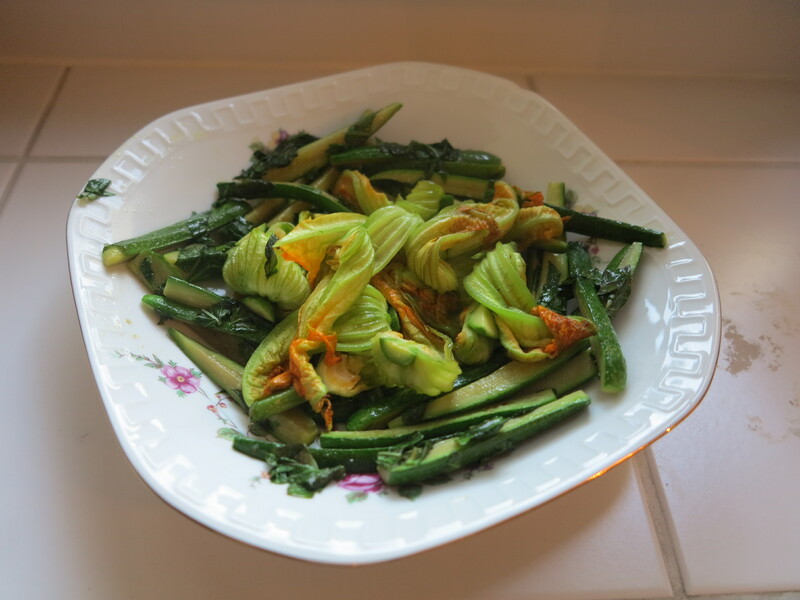 And since in my nervousness I had bought way more zucchini blossoms than needed (I was picturing myself having to throw away at least half of them) I had plenty leftover the next day, which I sautéed up with a little butter and fresh basil leaves. Also delicious! I will now be keeping an eye out for these delicacies each summer. This entry was posted in french fridays with dorie and tagged Around my French Table, finger food, seasonal - summer, side dish, vegetarian. Bookmark the permalink. Ooh I’ve never done anything but fry them. I’m intrigued by this sauté idea. I’m definitely in the don’t-care-about-soccer minority around here. I just nod while people around me speak at length about players I’ve never heard of. It’s safer that way. Ha! Your blossoms look great! Lucky you for being able to get some. I was thinking of you when I saw Sunday’s lineup. Good luck! I would never think of sauteing the blossoms, what a great way to serve them! Both of your versions look great! I’m hoping to get my hands on a few more blossoms before the end of the summer. I really enjoyed this one and so did my hubby…one never knows, does one? Good luck to Germany on Sunday!! how exciting!! I love that you had excess blossoms while we all struggled to get enough! they look great! Enjoy your football & catching up on sleep this week!! TWO gorgeous dishes! I desperately want to try the ricotta version! Wow, that’s an idea – sautéed. First I have to find blossoms which just aren’t showing up in our Farmers Market yet. Hopefully by this Saturday I will have some luck. Both your meals look delicious and your write-up gave me a bit more confidence that I can make these easily. I do like the part about the tempura covering up a number of sins. Nice Post. I do understand the World Cup madness even though I wasn’t in the middle of it like you. You left yours attached! How pretty. I think I literally tore every one of my blossoms, but I was amazed by how well the batter covered it up. I love forgiving recipes. Congrats to Germany on the victory! It must have been amazing to be in Germany after their win. In my neighbourhood, pandemonium erupts when Italy and Portugal meet on the field. I think I will stick to sauteeing these in future, though I really enjoyed the fried ones. Both of your dishes look amazing!! Mouth-watering. I never found any blossoms, though I’m still on the look-out.